At Model D, we’ve been writing a lot about green infrastructure in the last few months, a topic which includes home-scale rain gardens as well as large public initiatives like catchment basins in parks. But no matter how well we write about it, a-hem, there’s no excuse for getting outside and seeing some of this stuff in action with your own eyes. Luckily, there are several places to check out green infrastructure in the city and perhaps get ideas for your home projects. One of the best places to see a beautiful and environmentally friendly landscape is at William G. Milliken State Park on the Detroit waterfront. In the area near Atwater and Rivard streets, a compelling landscape of ponds, channels, wetlands and prairie creates the sort of environment needed to slow down the movement of water into the river that cleans the water prevents flooding. Highlights of the area at Milliken Park include the boardwalks and walkways that go along and over the wetlands, allowing visitors an up-close look at the various species that inhabit the space. These include a number of native flowering plants, insects, birds and even muskrats. You may be unlikely to install a muskrat-sized wetland on your own property, but this park is still a great place to visit to get ideas for rain gardens and prairie landscapes. It’s also a great place for kids. This writer has heard stories of children so distracted by the birds and butterflies in the wetland that they couldn’t be bothered with the nearby carousel. Surely this is a sign of progress. Rouge Park and the surrounding area are another great areas to check out green infrastructure projects. Bio-swales installed by the Detroit Water and Sewerage Department on Tireman to the west of the park line the road and catch water with the help of deep-rooted native plants. In the park itself–which is the largest park in the city–there is a wildflower trail to the west of Outer Drive near the junction of Tireman. This is an excellent example of the kind of low-cost, low-maintenance landscape that can be used to catch and sequester water in a prairie landscape. 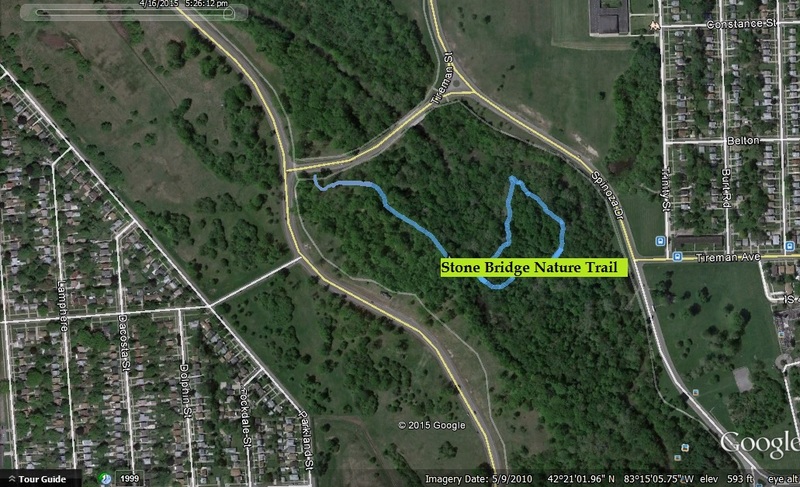 Nearby, off of Tireman itself is the Stone Bridge Trail, one of the nicer trails in the city. It wanders through the woods and wetland near the Rouge River. On a recent walk, I spotted a great blue heron here among other birds. There are also many examples of trees and understory species that thrive in wet environments, giving the gardener some ideas for the home garden. Also be sure to check out the bioswales at Cody Rouge's Stein Park, planted by high school students. Seeing these spaces first-hand also helps homeowners and gardeners see how their efforts connect and support the larger ecosystem. If we are going to protect our local waterways from flooding and pollution, we all need to do our part. The reward for this work will be a more beautiful and abundant local landscape–and above all, cleaner water. This story is part of a series on measuring on the role of green infrastructure projects in Detroit's redevelopment. Support for this series is provided by the Erb Family Foundation to Greening of Detroit, Model D, and The Nature Conservancy. Read more articles from the series here.